The history of this GT500 KR came from an unexpected source. It's always a pleasure to get emails from Shelby owners. When John first came on to some of the public forums, there was some skeptism on the part of long time time members. That can be a turn off to some newcomers, but John stuck it out. John owned his car for a long time. His history with the car dated back to the late 1970s. That is a very good thing. I usually advise people to search out the histories of their cars. Once you get back to pre-1985, you are in good shape. After that date, the depreciation curve started to turn upward. By the end of the 1980s, there was an economic incentive for people to revive cars that would have normally become scrap metal. So, even though John was in great shape, there was some history he didn't know. Bernie, a friend of the website, recognized the car. It was a car he knew well. Now for the first time, the complete history of # 4325 can be told. 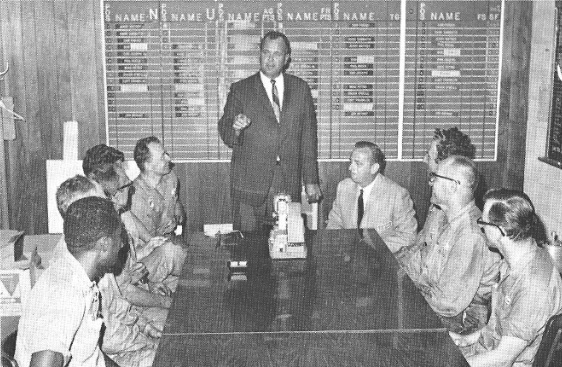 Southwest Ford dealer, Chuck Kane conducts a sales meeting. 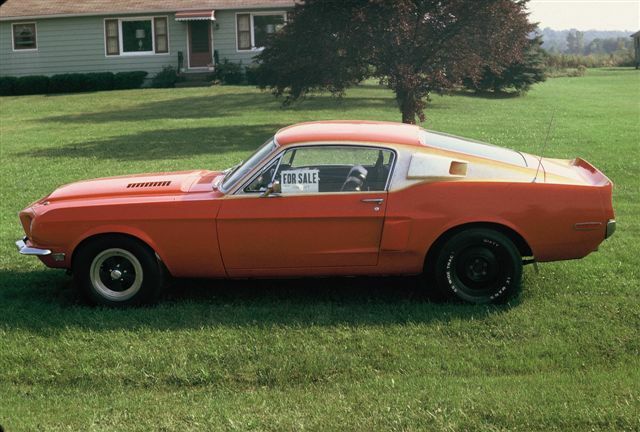 This was the last 1968 GT500 KR that came out of Southwest Ford in Parma Heights, Ohio. The car was originally Lime Green Metallic with a black interior. The salesman's name was Curt Franklin. Franklin was instrumental with the Southwest Drag Club. Curt ran a 68 1/2 super stock mustang and then a 69 Shelby GT500 ( with a stroker motor). The original owner of # 4325 had inherited a large sum of money and bought an F150 and a Thunderbird for his wife ( matching colors). He decided to get involved with drag race and purchase the Shelby. He lived in the Twinsburg, Ohio area. The car was heavily modified for racing. The front suspension had drag shocks, three inch "C" spacers on the upper ball joints and lower control arms were modified. The back of the car had Lakewood weld on bars, like they used on the Thunderbolts. He used real tall slicks which caused him to modify the wheel opening and wheel wells. This was done crudely with a large hammer. The transmission wass a full "crash box" that had a Hertz shifter. The motor had a dual point distributor, headers and short aluminum valve covers. The internals were kept stock. The car had a red devil on the front edge of the door. It was holding the chrome snake in its hand on the fender. The car was called Satin's Child. The best he could get it to run was in the 13:10s. He put the car up for sale for lack of funds. The second owner was Jerry Sperber from Strongsville, Ohio. Jerry and his friends played with the car for a short time . The best time they could get out of the car 12:98 at 106mph. The car was then returned to "stock" condition. Bernie's brother did the body work and paint on the car. The wheel wells and wheel openings were repaired as economically as possible to the satisfaction of Jerry. Jerry requested a paint color that was unique that no one else would have. After the completion of the car, Jerry only put on 100 miles if that. It was put up for sale because of the insurance expenses. Here is the car for sale on Drake Road, in Strongsville, Ohio. John purchased the car in 1973. This is where John's story begins....we know he was the next owner. So, the story is complete. It's always fun to put the stories together. If you have an interesting Shelby story, don't history hesitate to share it. Maybe there is a little devil in your details?